Spend a weekend in a wintery log cabin at the Snow Resort with Andrea and Amy. Take the snowmobile out for a ride or hop into the outdoor hot tub to warm up. Prepare a meal for your friends in the kitchen, then snuggle up on the sofa near the fire with the husky puppy and talk about all the winter fun you've been having. Head upstairs for a good night's sleep, ready for another day of fun in the snow. Price is 29% below the initial Lego retail price, a € 13.52 discount! This comes down to 8.21 cent per brick. 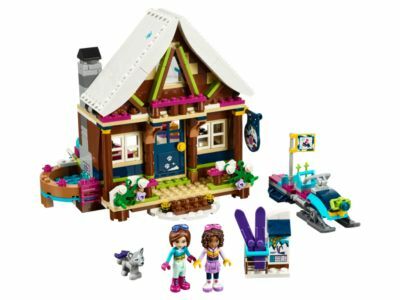 The Snow Resort Chalet (41323) Lego set is available from the sites below. However, they do not offer delivery to your selected region. The Snow Resort Chalet (41323) Lego set is no longer directly available from the sites below. However, 3rd party partners of these sites might still have the set available. Alternate description Stay cozy and warm in the beautiful log cabin!